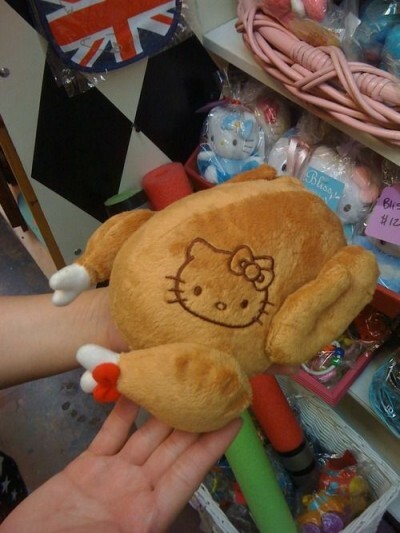 Weirdly I love chicken and I love Hello Kitty but together just seems very strange. Agreed, this has been out for a while. Mr. HKH is REAL late on featuring this. This kind of toy has been around for years and tons of kids own these kind of pillows/dolls. 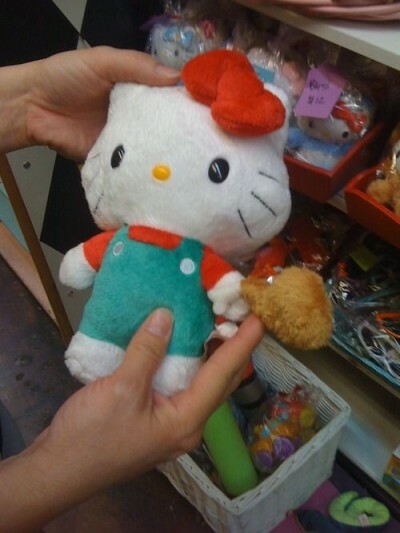 And besides, this particular Sanrio toy is meant for toddlers, one that I would totally buy for my baby girl. In fact, I think I’ll be purchasing that right now…..
You’re right about the people at Sanrio not even trying any more. 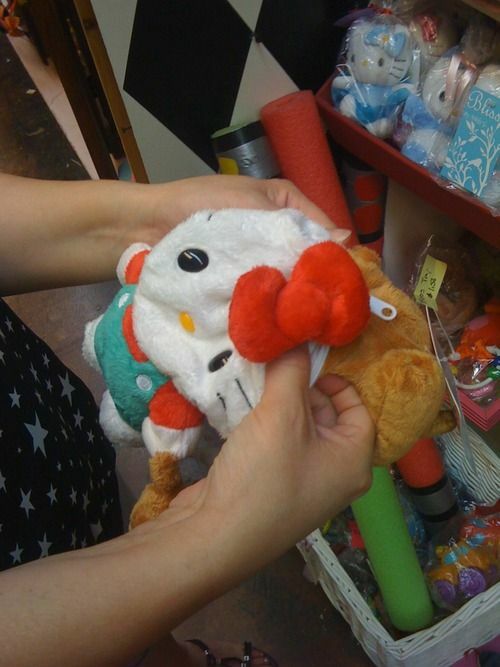 All I see of Hello Kitty now is overpriced junk. In addition to the stuffed turkey, they also have a stuffed HK hamburger plush. Well, kitties DO like to eat chicken & turkey! I took these photos, by the way, and I don't mind them being used! It's just so crazy how popular it got, damn! Those are my mothers hands, and the photos were taken in a little boutique in downtown Glendale, Arizona. They toys may or may not be there still, I haven't returned in quite some time. So useless its funny. Like One Direction. But to my knowledge they are not reversable. The only use I can think of is as a turkey confuser. A turkey with a cats face on sure would confound the feathered jowly ones. And cats may not wish to eat it. I have this one!! We got it for my daughter who was born on Thanksgiving. But I agree, it’s ridiculously odd and gives me and my husband a good laugh whenever we play with it.